The United States and Japan have been security allies since 1951. America has provided Japan with a nuclear umbrella, safeguarding it against Russia, China and now North Korea. Japan has afforded U.S. military forces forward bases in Asia. Since 2002, in all but one year (2008), a majority of Japanese have held a favorable view of the U.S. In 2018, two-thirds (67%) see the U.S. positively, up 10 percentage points from 2017. Such support for America is lower than its peak (85%) in 2011, in the wake of U.S. aid to Japan in the aftermath of the Tohoku earthquake and tsunami. But it is comparable to that in several years of the Obama administration. Japanese hold far more positive views of America than do many other U.S. allies, including Australians (54%), the British (50%), French (38%) and Germans (30%). But the Japanese public has less esteem for America than do Filipinos (83%) and South Koreans (80%). Japanese men and young people express more favorable sentiment toward America than women and older Japanese, as do people with more than a high school education. Approval of the U.S. is broadly shared across adherents of the major political parties in Japan, with the strongest backing from those who have a favorable view of the LDP and Komeito. 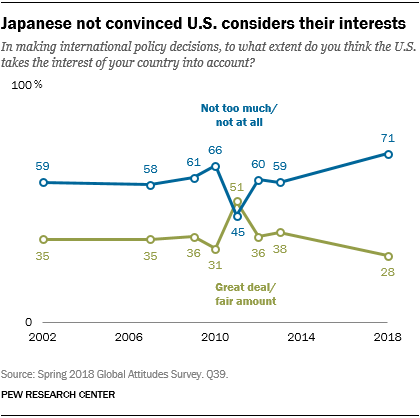 Confidence in the U.S. president to do the right thing regarding world affairs tends to parallel views of the U.S. in many countries, including Japan. Just three-in-ten Japanese express faith in President Donald Trump, up 6 percentage points from 2017. While this is an improvement, this is still the third-lowest confidence in an American leader in 13 years in Japan. Japanese faith in Trump is lower than that in the Philippines (78%) and South Korea (44%) and comparable to that in Australia (32%) and the United Kingdom (28%). Japanese confidence in the president is higher than that in Germany (10%) or France (9%). Japanese men (36%) have significantly more faith in Trump than do women (23%). Support for the U.S. leader is lowest among CDP backers (28%). Relative to their view of some other prominent world leaders, Japanese adults have a decidedly more negative opinion of Trump. 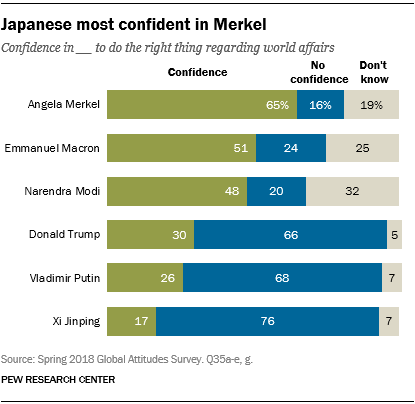 About two-thirds (65%) of Japanese express confidence in German Chancellor Angela Merkel’s handling of world affairs. Roughly half have faith in French President Emmanuel Macron (51%) and Indian Prime Minister Narendra Modi (48%), though both leaders have notably high “don’t know” responses at 25% and 32%, respectively. 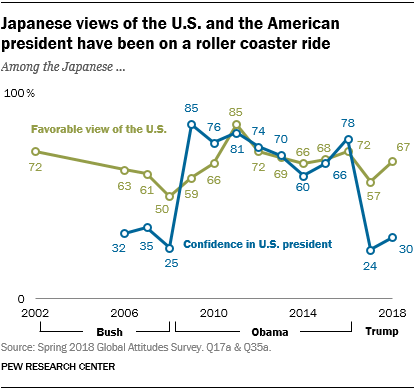 Japanese views of the U.S. president are roughly comparable to those of Russian President Vladimir Putin (26%) and much better than the public’s judgment of Chinese President Xi Jinping (17%). The uptick in Japanese confidence in Trump and favorability of the U.S. comes in the wake of the Trump administration’s focus on curtailing North Korea’s nuclear weapons program, which nearly two-thirds of Japanese were very concerned about in 2017. For most of the past decade, Japanese have seen the U.S. as the world’s leading economic power. Today, a majority (58%) express such a view, a much larger share of the public than sees China (29%), the countries of the European Union (5%) or even Japan itself (4%) in that role. 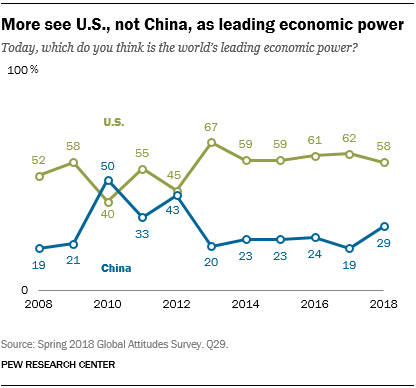 But the public’s assessment of China’s economic power is up 10 percentage points since 2017 and is now at its highest level since 2012. The advent of the Trump administration does not seem to have markedly affected Japanese views on U.S.-Japan relations. In 2017, a plurality of Japanese (41%) expected relations with the U.S. to get worse in the wake of Trump becoming the American president. But in 2018, only 19% say relations have gotten worse. Nearly two-thirds (64%) believe things have stayed about the same. What has suffered in recent years in the eyes of many Japanese are certain aspects of U.S. soft power. 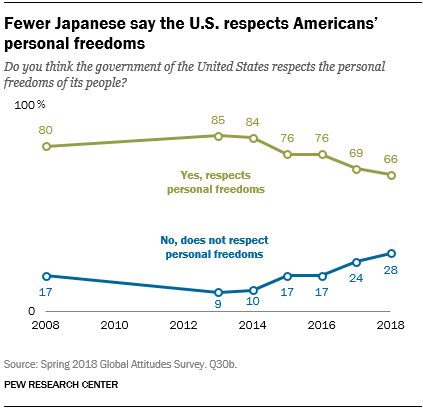 Two-thirds of Japanese say the U.S. government respects the personal freedoms of its own people. This is a much more positive judgment than the Japanese assessment of China’s record on civil liberties. But Japanese views on U.S. protection of Americans’ civil rights is down 19 points from its peak in 2013. The decline began around 2014. Men (73%) more than women (60%) see the U.S. as respectful of Americans’ personal freedoms. The Japanese public has long believed that the U.S. acts unilaterally in world affairs. In 2018 such sentiment has strengthened: 71% believe Washington does not consider their interests when conducting U.S. foreign policy, up 12 percentage points since 2013. Japanese views are roughly comparable to views about U.S. unilateralism in the UK (72%) and Australia (68%). But such criticism in Japan is less than that expressed in France (81%), Germany (80%) and South Korea (75%). The Japanese are, however, much more judgmental than the Filipinos (23%). A plurality of Japanese (43%) also voice the view that the U.S. is doing less to address global problems than it did a few years ago. Such views of American engagement in dealing with shared world challenges differ greatly depending on expressed confidence in President Trump. Among those Japanese who lack confidence in Trump, 50% say the U.S. is doing less to help address major global problems. Among those who voice confidence in the president, just 30% judge the U.S. as doing less. While 37% of supporters of the ruling LDP believe America is doing less in the global arena, 47% of those who back the opposition CDP hold that view. Japanese views of U.S. efforts on world challenges is roughly comparable to the views of Australians, 46% of whom say Washington is doing less. Japanese are more critical than South Koreans (37%) and Filipinos (18%). They are less likely to disapprove than Germans (75%), the British (55%) and the French (53%). Despite souring attitudes, the Japanese public is very clear about its choice for the world’s leading power: the U.S. When offered the choice of whether they would fancy the U.S. or China to lead the world, 81% of Japanese choose America. Such Japanese support is stronger than in the Philippines (77%), South Korea (73%), Australia (72%), the UK (67%), France (65%) or Germany (58%).